we haven't always been avid bib users. i found them kind of annoying, personally...that is until my tot decided when he's done eating, that he's going to start spitting out what's left in his mouth. my husband discovered these bibs, called "tidy turtles" at the grocery store. now, i am not crazy about all the designs, but we got the race car bib, and it's cute. i would also consider getting the wild animals and space designs...the bottom row...um...no. the best thing about this waterproof bib? it was $2.99 and it's nice and big. 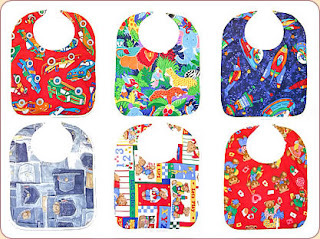 i didn't realize until recently that there's infant bibs, then there are toddler bibs...HUGE difference. this bib is nice & large and really helps the new food spitting issue. and as if they were reading amy's mind, they also make a nice little art smock!